Animal rights activists have succeeded in obtaining a ban on horse-drawn carriages in Rome's historic centre following several traffic accidents. The 44 horse-drawn carriages will be confined to parks during the week, under plans drawn up by the city, and allowed in the centre only at weekends. They will be replaced on weekdays by electrically-powered vintage cars. 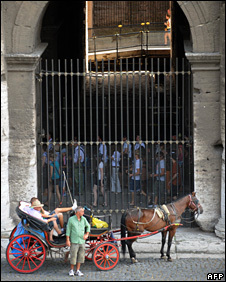 Last year, a horse had to be put down after being hit by a truck and breaking its leg on a street near the Colosseum. Italy's deputy tourism minister said the plight of horses drawing the carriages in polluted and crowded streets had become a scandal, leading to the deaths of several animals among the 90 employed. "The time has come to abolish this anachronism," Michela Vittoria Brambilla said, according to the UK's Times newspaper. The BBC's David Willey in Rome says that for centuries, cab drivers have been picking up passengers at the foot of the Spanish Steps and driving their horse-drawn carriages through the city. They are really not happy about the decision of the city authorities to withdraw their licences because of the chaotic weekday traffic, our correspondent says. Gianni Montoni, who has been driving his carriage for the past 15 years, told the BBC that the city authorities did not want horse-drawn carriages going through the city any more. Our correspondent says the Roman cabbies do not seem to want to go along with a proposal to keep the tourists happy by driving round Rome in electric-powered "period" cars instead of their elegant traditional horse-drawn vehicles. The carriages will instead be relegated to parks such as the Borghese Gardens, and not allowed to ply for hire on the streets of the city except at the weekend. Final details on how the ban will be operated are set to be decided by the city authorities on Wednesday. The clip-clop of horses' hooves on the cobbled streets of Rome may soon be only a memory, our correspondent adds.